Joe Ovies and colleagues at 850 The Buzz in Raleigh have come up with a list of the five worst groups of fans in the Atlantic Coast Conference. The winner is Maryland, whose followers are described as "crude, disgusting, and at times dangerous." Also making the list are Miami, Clemson, Duke and North Carolina State. Clemson fans, according to Ovies, need to cleanse themselves of the past: "As cloning technology continues to improve, the dream of a second coming of Danny Ford is closer to reality. Tiger Fan doesn't even care that the cheating can’t be removed from his DNA." How does Clemson fans wanting their team to be the best make them bad fans? The stadium is packed for every game, people care about the team more than anyone else in the ACC, and on top of that, they are some of the nicest fans in the country. Clemson fans are the best in the ACC, hands down. That's coming from a Yellow Jacket. As a Seminole fan, I have to disagree with the inclusion of Clemson fans in this list. My favorite road game every year is Bowden Bowl at Death Valley, and tailgating before and after with the Clemson folks surrounding us is part of the reason after. I should say, road game every other year. Maybe they think we're the worst because we're the toughest place to play in the ACC. The fact that they put Duke on there makes this lose any validity that it may have had. Duke doesn't have nasty fans, in football at least. You could fall asleep at a game there and the other 14 people that fit in their stadium wouldn't even notice. At least we can all agree Maryland fans are the worst. I think that Maryland fans are actually the best fans in the ACC. #1: Maryland - I agree, these guys are jerks, they're ungrateful winners, and awful losers. #2: Georgia Tech - For sheer obnoxiousness. We had glass bottles thrown at us, people trying to pick fights, after GT beat us. Usually you see this when you beat the home team. #3: Miami - Not quite as obnoxious as GT fans, but equally aggressive in the stands and outside the stadium. Other than those three, I don't mind going anywhere else in the ACC. I will never go see a game at Maryland again, those people are just bent. I think UNC fans actually come from Hell. Having said that, they're generally nice. I agree that Maryland fans are by far the worse. I live in the D.C. Metro area and I am an alumni of the Florida State University and go to support FSU whenever there is a game (regardless of the sport) at College Park. The Maryland fans are always extremely rude, try to provoke fights, and have even run through our tailgates numberous times trying to knock things over or steal things from us. It always amazes me the level of animosity that UM fans have. I went to the first FSU-Maryland game when FSU joined the ACC and without any history between the two programs the Maryland fans were acting like they had hated us for years. I have actually been treated better in Gainesville or Miami then at College Park. I agree that Clemson does not deserve to be on that list. At home or at away games they always come across as a class act. I think Ga Tech should take their place. Even on the road Ga Tech fans are tremendously rude and stupid. At a game in Tallahassee after FSU had beaten them I remember Ga Tech fans being incredibly obnoxious in Doak Campbell, not the wisest move to make. Agree 100%. Wearing the opposing colors of a team beating UMD's arse, trips to the bathroom are dangerous. We're talking about fans who say brilliant things like, "why are you here?" It's obvious that they relish being jack@sses. But that's sad, considering the huuuge population base and supposed difficult entrance requirements. Maybe they're making up for the mediocre product Fridge has been fielding for the past 3 years. Either way, there's a difference between being a hostile environment and being downright dangerous. I'm a die-hard Terp fan and alum, and will agree that we have some very rude fans. I'm only 30 years old...hardly an old stick in the mud. 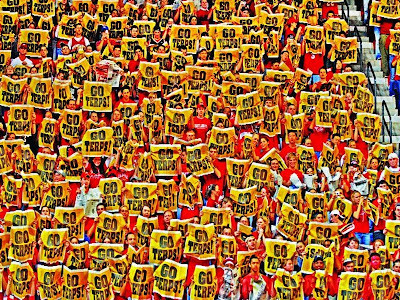 No fan base is perfect, but I've heard too many obscene chants from Terp fans, I've seen too many students pick fights with opposing fans who are just there to have a good time, and overall I've become embarrassed at the sheer number of Terp fans that act like jackasses overall. They support their team just like every other ACC fan, but they don't do it with any class. NCSU fans are the WORST in the ACC. Not even close for second place. People die at their tailgates and their fans are always drunk, obnoxious and looking for fights. They give WVU fans a run for their money for world's worst. I'm a Maryland supporter, and I love guns, alcohol, and any combination of the two. I'm amazed I'm spelling all of these words correctly. I'm missing several teeth, and I think that wearing the image of a turtle is intimidating. I also get mad at people supporting other people, who happen to be moving a ball down a field better than the group of people I am supporting. Maryland, NC State, and Virginia.